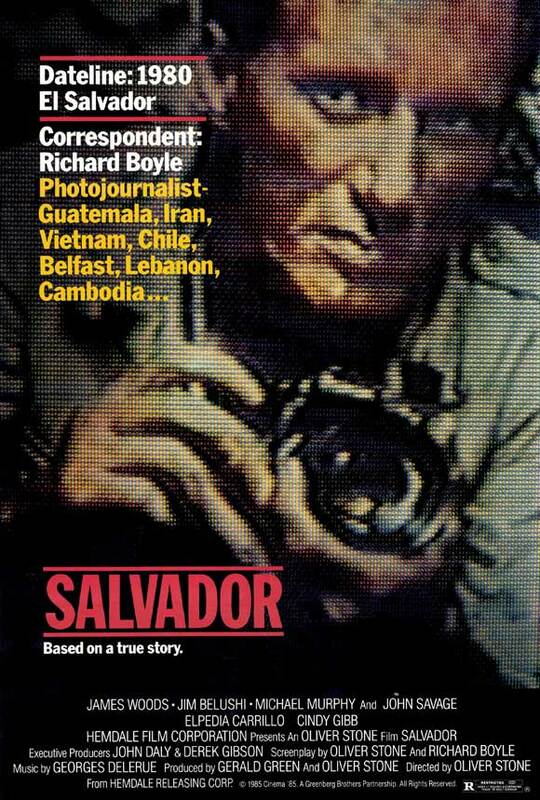 A down-on-his-luck photojournalist (James Woods) drags his reluctant friend (James Belushi) with him to conflict-ridden El Salvador, where he attempts to chronicle the rise of military power and guerrilla resistance. Peary doesn’t review Oliver Stone’s Salvador in his GFTFF, but he names it one of the Best Films of the Year in his Alternate Oscars, where he gives Woods the Best Actor of the Year award, and discusses his memorable performance at some length. 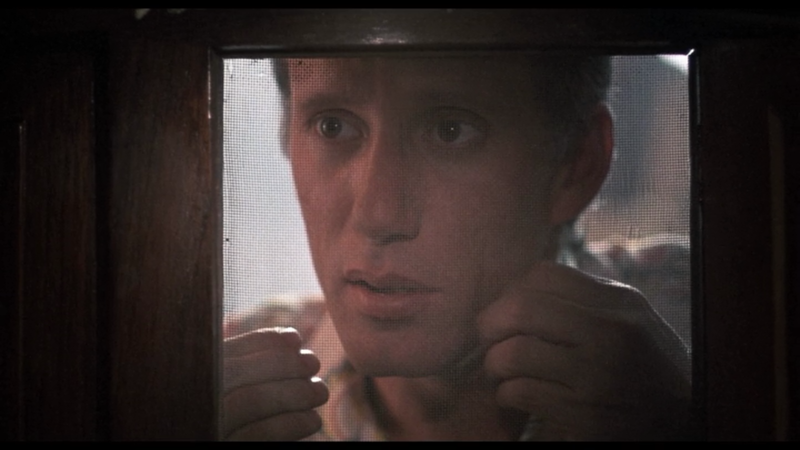 He notes that “no one is better at playing hustling, live-wire, sleazeball opportunists than James Woods”, who “found his ideal role as Richard Boyle” (upon whose real-life adventures the film is based; he co-wrote the script with Stone). Woods accomplishes the astonishing feat of turning his self-proclaimed “weaselly” character — a man who “drinks and whores; takes drugs and smokes like a furnace; borrows money he’ll never pay back; lies, brags, cons, annoys, gets in everyone’s face” — into someone we don’t mind watching for two hours, and even come to feel some respect for by the film’s harrowing ending. Indeed, we can’t help (on some level) admiring this man who willingly puts himself in the middle of a war zone simply to hustle a story; sure, he’s selfishly doing it to make a buck, but his actions take guts, and he consistently demonstrates a remarkable degree of savvy (in notable contrast with the stupidly reckless behavior of many of his companions). Woods’ memorable performance grounds the story, but the film itself remains impressively mounted on every count, sparing no detail in showing us the grim, bloody, chaotic reality of life in El Salvador at the time. Stone struggled to receive adequate financing for the film, which was made on a relatively small budget, but you’d never know; we genuinely believe we’ve been plunged directly into the melee of this specific time and place. Not all the scenes or performances in Salvador work equally well: I’m still not convinced that Belushi’s character is all that relevant, for instance, and a rival “yuppie” news reporter (Valerie Wildman) is painted in overly broad strokes; however, Stone is consistent enough in his presentation of the topic to keep us sufficiently engaged and enraged. 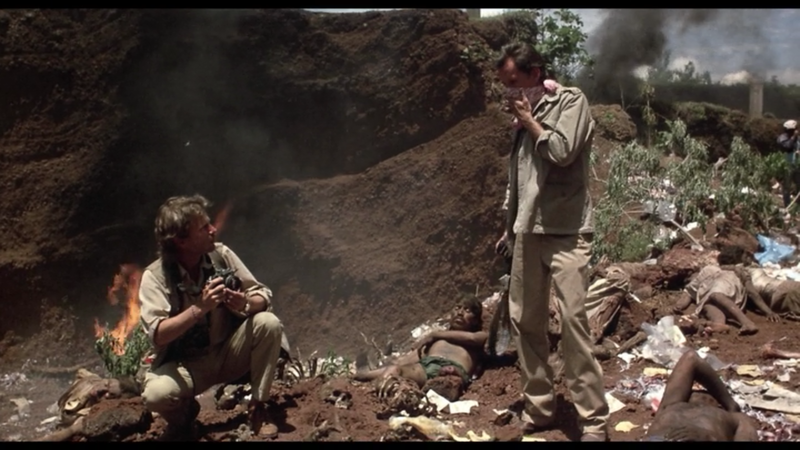 Comparing this film with Haskell Wexler’s well-meaning but ultimately disappointing Latino (released the previous year), one further appreciates Stone’s ability to not only humanize the Salvadorian conflict, but to make it dramatically engaging as well. Many consider Salvador to be Stone’s most under-appreciated film, and there may be some truth to this sentiment. Yes, as a powerful and important political thriller. Listed as a Sleeper and a Personal Recommendation in the back of Peary’s book, and nominated by Peary as one of the Best Films of the Year in his Alternate Oscars. I’m rather in agreement with the assessment (particularly the comparison with Wexler’s ‘Latino’), so little to add. I also agree that this could be Stone’s most under-appreciated film. For me, Stone’s films are unique in that I never feel like going back to them – only because they’re so hard-hitting and hard to take and can exhaust you (as they’re usually intended to). As a result, a single viewing of one of his films can seem to suffice since you won’t easily forget it. Seeing ‘Salvador’ again, I realized I had not forgotten it at all. And Woods does carry the day here. It’s a very brave performance. What appeals to me most, however, is the fact that – in his character’s most lucid moments – he understands the US involvement in El Salvador. Boyle is an operator himself…so ‘it takes a thief…’.